Little Mami was discovered in the dead of winter, huddled with two brothers and her mother in the dumpster behind a high school. They had fought so hard to survive, but being feral, they weren’t sure what to make of human intervention. The cats were taken into a foster home, but they had difficulty adjusting to life around humans. Mami lived closed up in her new rescuer’s bathroom for days, hissing at them and hiding behind the toilet when they came in. It was a while before she felt safe enough to be around humans, but slowly, she opened up to them.At first, her new humans didn’t know how to act around her, but after researching what it meant to calm a feral cat, they took each moment as it came. She was frightened of noises – a sneeze would sometimes send her scrambling to hide under the bed – and human contact terrified her. One day, without warning, she reached out a tiny paw to her human…and allowed brief contact. She had accepted them into her life! While she still doesn’t enjoy cuddling, she does like to be near. She sits by her humans on the couch and often allows them to scratch behind her ears! Every morning, they wake up to these adoring eyes…and love every minute of it! 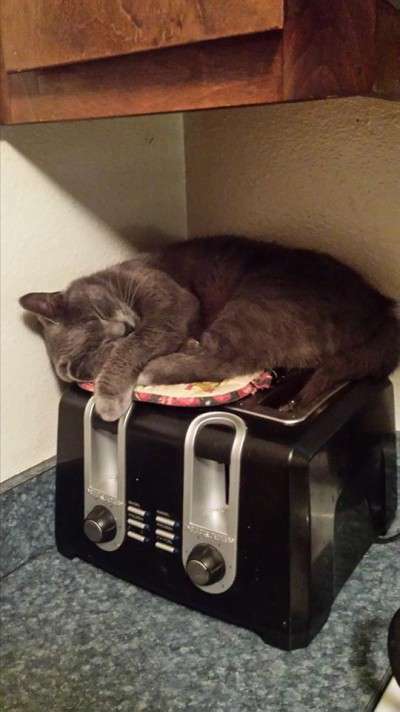 My Misty has found a new place to sleep!